66% of companies do not believe their sales managers have the skills needed to manage and coach sellers. 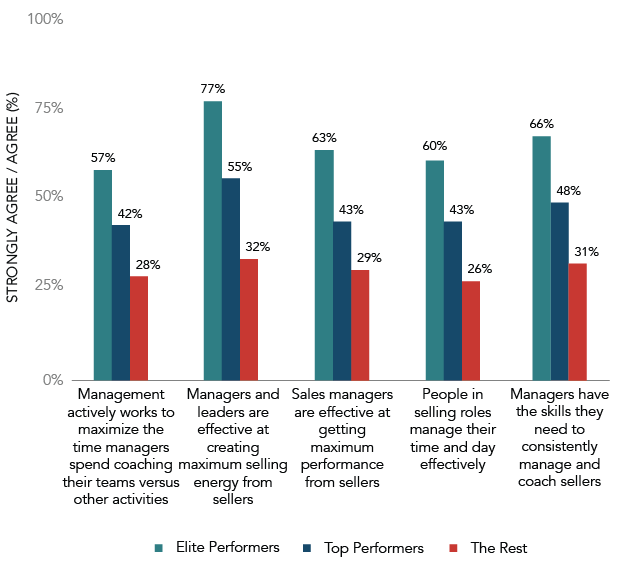 Elite performers are 2.4x more likely to agree that sales managers and leaders are effective at maximizing selling energy. 71% of companies do not believe people in selling roles manage their time and day effectively. Almost 7 out of every 10 sales managers do not have the skills they need to do their jobs effectively! Astounding. It's certainly understandable, though. Sales managers are directed, by the very definition of sales management, down the wrong path. According to Wikipedia, sales management is a business discipline focused on the practical application of sales techniques and the management of a firm's sales operations. Sales planning: involving strategy, setting profit-based sales targets, quotas, sales forecasting, demand management, and the execution of sales plan. Recruitment of sales staff: the 3 recruitment tasks used in sales management are job analysis, job description, and job qualifications. Sales reporting: including reporting the key performance indicators of the sales force. According to the core definition, sales management focuses on hiring, onboarding, planning, and analytics. There is no suggestion that sales managers should help sellers create and win opportunities, be highly motivated, control their time and focus, and achieve their sales goals. Left to their own devices, sellers don’t do nearly as well here than if they have the support of sales management. Sales management is an important leverage point for many companies. Sales managers hold the keys to unlocking top sales performance. To do that, you must change the way you think about sales management and the core roles of your sales managers. Along with the other well-known responsibilities of sales managers, they also much coach their sellers. Motivate: Sales managers help to sustain maximum sales energy on an ongoing basis across the sales team. Focus: Sales managers help sellers build goals and action plans and help them focus their time to achieve those goals. Execute: Sales managers help their sales teams get the most done by holding sellers accountable to their action plans, and being highly productive while they work. Advise: Sales managers help sellers create and win the most opportunities. Develop: Sales managers work with sellers to improve their capabilities, develop sales skills and coach sellers to achieve top performance. The companies that add sales coaching to sales management and invest in sales management training reap the rewards. When you consider that The Rest represent 80% of respondents, the sad state of sales management in many companies becomes even more obvious. If you can focus your sales managers on maximizing the results produced by your sales team through defining sellers’ goals and action plans, motivating sellers, developing seller skills, advising sellers to create and win opportunities, and helping sellers execute their plans, you will unlock a powerful lever that can launch your team into sales success. It all starts with focusing on coaching as a core role of the sales manager.